Description: AAA Dental Studio Inc is a business categorized under others health services, which is part of the larger category dental laboratories. 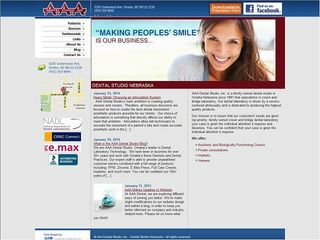 AAA Dental Studio Inc is located at the address 5205 Underwood Avenue in Omaha, Nebraska 68132-2239. The President is Bill Bone who can be contacted at (402)553-8846. Location & access map for "AAA Dental Studio Inc"